It is nothing like childbirth. Joyce Carol Oates has done it more than twenty times, so too, did Iris Murdoch. Patrick White notched up around a dozen, as has John Coetzee. Childless the lot of them. I am, of course, speaking about books: writing and publishing books. I’ve published 7 novels. With each one I have been asked by otherwise sensible people if it’s like a birth, or perhaps the grown child leaving home. The answer is a simple, obdurate: NO. — No messy communion with another in order to get the project started. — No incessant consultation with another as the project progresses. — No constant negotiation with the object itself for the next twenty or thirty years. There are the delights of lolling around in your imagination for two or three or four years, until you’ve got the project into perfect shape. There’s the pleasure of solitude, of working in isolation, of reading and writing – just you and the emerging project and the best minds that have ever put pen to paper. There are the regular frustrations and irritations and challenges that serve to remind you that being human is all about the necessity – and the discomforts – of change. There’s the knowledge that eventually you’ll hone this mess of ideas and characters into a form that makes sense to other people, a form that’s sufficiently elegant to meet your own hard-to-satisfy standards. I attend to crabbed minutiae and am self-trammeled through taking pains. I am a kind of human snail, locked in and condemned by my own nature. The ancients believed that the moist track left by the snail as it crept was the snail’s own essence, depleting its body little by little; the farther the snail toiled, the smaller it became, until it finally rubbed itself out. That is how we perfectionists are. Say to us Excellence, and we will show you how we use up our substance and wear ourselves away, while making scarcely any progress at all. The fact that I am a perfectionist in a narrow strait only, and nowhere else, is hardly to the point, since nothing matters to me so much as a comely and muscular sentence. It is my narrow strait, this snail’s road; the track of the sentence I am writing now; and when I have eked out the wet substance, ink or blood, that is its mark, I will begin the next sentence. Only in treading out sentences am I perfectionist; but then there is nothing else I know how to do, or take much interest in. Not the sort of approach recommended in the raising of a child. You write, you read, you revise, you read and write some more, you shape and reshape, you lop off the juts and bumps, you sand the rough surfaces, you send it to your agent who sends it to your publisher, there’s more work to be done (but she loves it, you tell yourself, my publisher says she loves it) and then it goes into production. There are proofs and more proofs and cover roughs, then the novel is with the printer and there is nothing more to be done. Two days ago a delivery man arrives with a box from HarperCollins. My delighted surprise must have been writ unambiguously across my face (I’d not expected this parcel for another week). The young man asks about the contents of the box. Advance copies of my new novel, I say. Now he is looking pretty excited too. Are you a reader? I ask. It turns out he is, so I invite him to share my joy. Picture it, the two of us on my narrow porch opening the box, burying through the padding, and then the book in my hand, the two of us poring over that very first copy. He agrees it looks splendid, that there is mystery in the cover. ‘Yeah,’ he says, ‘I’d want to read it.’ He particularly likes the rainbow lorikeet flying among the pillars of the neoclassical building depicted on the front. We flip through to make sure the pages aren’t blank (one of the writer’s nightmares). All is well. When the young man turns to leave, he addresses me by name: ‘Goodbye, Andrea,’ he says, ‘and congratulations.’ It is a lovely and unexpected connection. I carry the box inside. My dog, a literary canine in the tradition of Flush, recognises the significance of the occasion. In the living room I withdraw each book one by one. No matter how many times this happens – the arrival of first copies – the magic never diminishes. Nor the excitement, nor the pleasure. The thing, fully formed, bearing the authority of print, the public cladding of a cover, your own name written on the front – not that that strikes you, or at least not me: the book is a thing in itself, not simply mine any more. This household was for a many years a two-writer household. The same ritual was observed every time advance copies arrived. I now prop the books side by side, covers facing out, on the shelf above the TV and l study them. I see how the light plays on the print – how the letters shine against the matt finish of the cover image – how the title, THE MEMORY TRAP, large and silvered in certain light actually seems to lure the observer in. I focus on the image itself that could well be the colonnade of the British Museum, and the flash of a rainbow lorikeet between the columns; the orange on the parrot’s breast is the same colour as the umbrella carried by the woman walking down the colonnade. And there in the colonnade’s shadows is a man in a suit. I had minimal involvement with the creation of the cover, I can, therefore, admire it whole-heartedly. It is, I decide, perfect. I take down a copy – as one would in a bookshop – there’s another rainbow lorikeet on the spine – and then to the back. I’m oddly nervous about reading the blurb even though I wrote it myself, even though I’ve read it about three thousand times. It’s as if its placement in situ might somehow disrupt the flow of words. I force myself to read it. No alchemy has occurred. And Rai’s generous words – in gold, the same colour they’ve used for the author name on the front. I like that. I open the book. There are surprises here – good surprises – but I cannot read the text, not yet. If I find mistakes, if I find sentences that fall over there’s nothing I can do about them now. Later, I’ll read it. For the moment I’ll just enjoy the object. It’s nothing like a birth. My work is done. And until the reviews begin, I can indulge myself in the pleasure of the thing itself and the wonder that fiction inspires. 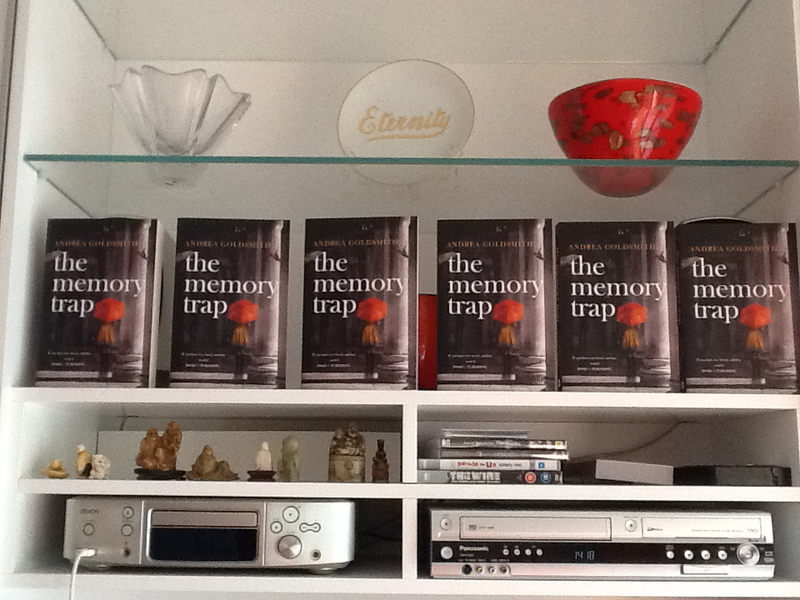 This entry was posted in books, Publishing, The Memory Trap and tagged literature, The Memory Trap, writing on April 7, 2013 by Andrea Goldsmith.